Renowned trumpet player Roger Ingram and master mouthpiece maker Peter Pickett have collaborated to develop this unique signature mouthpiece line. The brand new "Lead-2" and "Studio-2" are the most recent additions. Please see the descriptions below for complete details. Click the model name to show/hide a complete description and photo of each mouthpiece. This custom V-cup mouthpiece is a duplicate of the V-cup Roger Ingram has played for decades. Roger uses this mouthpiece for specific upper register demands. 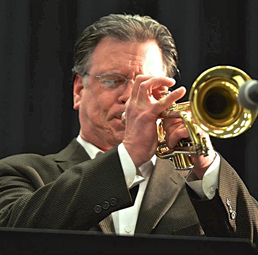 He used this mouthpiece on many of the recordings he did with Harry Connick, Jr, including "Blue Light, Red Light." 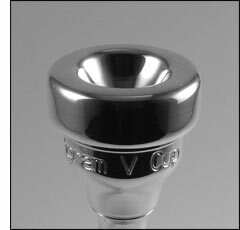 The backbore of the Ingram V-cup mouthpiece is medium-to-open. The backbore's cylindrical section has been adjusted to optimize accuracy and provide greater ease of slotting in the upper register. The taper of the cup's V is slightly "bowled" from a straight taper. This is a standard length mouthpiece. The inner rim diameter is 0.609". The outer rim diameter is 1.020". The shank is equivalent to a Reeves 4.5 sleeve. This mouthpiece comes stock with a #30 drill. This mouthpiece projects extremely well and yields a bright sound. This mouthpiece is a duplicate of the mouthpiece Mr Ingram used on every big band he performed and recorded with during the many years he spent on the road. This mouthpiece has been improved by optimizing the cylindrical section of the backbore yielding significantly better slotting in all registers. Even though this mouthpiece is still available, Roger now uses the new Ingram "Lead-2" mouthpiece. The inner rim diameter is 0.619". The outer rim diameter is 1.057". The shank is equivalent to a 4.5 Reeves sleeve. This mouthpiece comes stock with a #30 drill. 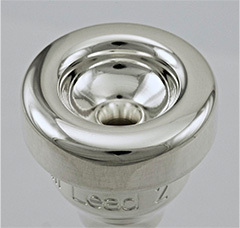 The Ingram "Lead-2" mouthpiece is a great all-around commercial trumpet mouthpiece. 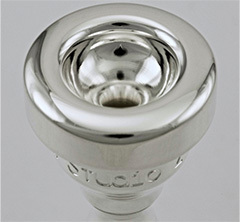 This mouthpiece offers a brightly focused sound with a nice range of harmonics. It records well, it's great for playing lead in a jazz ensemble, and is spot-on for doing upper register work. 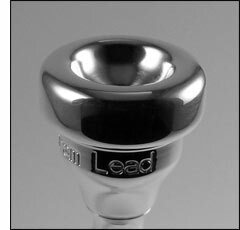 This is a slightly deeper version of the original Ingram "Lead" mouthpiece. Increasingly in-demand for a greater variety of work, Roger has switched to a mouthpiece which has a slightly wider inner rim diameter, a slightly deeper cup, and a larger throat. This is the lead mouthpiece that Roger now uses for all concert performances. The cylindrical section of the backbore has been optimized, yielding significantly better slotting in all registers. The back-bore has a comfortable feel and is slightly tighter than standard. The inner rim diameter is 0.625". The outer rim diameter is 1.062". This rim is very similar to a Mt Vernon Bach 10 1/2. The cup depth is approximately .205". The shank is equivalent to a 4.5 Reeves sleeve. This mouthpiece comes stock with a #28 drill. The Ingram Studio Mouthpiece is great for commercial recording work. This is the mouthpiece Mr Ingram used during his years in New York City when he was subbing on Broadway shows and doing session work, in-between tours with Harry Connick, Jr., Ray Charles, and Paul Anka. This mouthpiece has a bowl cup, and is slightly deeper and wider than the original "Ingram Lead" mouthpiece. The inner rim diameter is 0.645", the outer rim diameter is 1.060". The cup depth is 0.380". The shank is equivalent to a 4.5 Reeves sleeve. This mouthpiece comes stock with a #29 drill. The Ingram "Studio-2" mouthpiece is great for all-around work. This mouthpiece offers a broad, focused sound with a full range of harmonics. It records well, and is ideal for playing any chair in a trumpet section. Increasingly in-demand for a greater variety of work, Roger has switched to a studio mouthpiece which has a more comfortable rim and a slightly larger throat. This is the mouthpiece that Roger now uses for most commercial recording work. The cylindrical section of the backbore has been optimized, yielding significantly better slotting in all registers. The backbore has a comfortable feel and is slightly tighter than standard. The inner rim diameter is 0.625". The outer rim diameter is 1.062". This rim is very similar to a Mt Vernon Bach 10 1/2. The cup depth is approximately .215". The shank is equivalent to a 4.5 Reeves sleeve. This mouthpiece comes stock with a #28 drill. The Ingram Be-Bop trumpet mouthpiece is ideal for straight-ahead jazz improvisation. 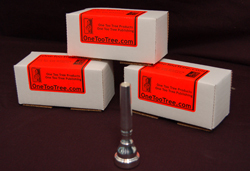 This mouthpiece is also an excellent all-around "middle of the road" mouthpiece for a greater variety of playing needs. 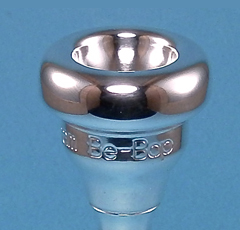 This mouthpiece can also work well as a lead trumpet mouthpiece for those players who started out on large cupped mouthpieces. The Be-Bop affords a player an easier attack, due to the slightly sharper inner bite of the rim. The inner rim diameter is 0.655". The outer rim diameter is 1.098". The shank is equivalent to a 4.5 Reeves sleeve. This mouthpiece comes stock with a #28 drill and the backbore is slightly more open than other mouthpieces in the Ingram line. The Ingram Jazz trumpet mouthpiece is ideal for small group improvisation and orchestral work. 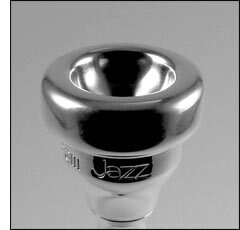 This mouthpiece has a bowl cup and is significantly deeper and wider than the Ingram Be-Bop mouthpiece. The Ingram Jazz mouthpiece has a dark sound and offers great flexibility. The inner rim diameter is 0.648". The outer rim diameter is 1.066". The cup depth is 0.427". The shank is equivalent to a 4.5 Reeves sleeve. This mouthpiece comes stock with a #28 drill. The backbore is slightly more open any other of the mouthpieces in the Ingram line. 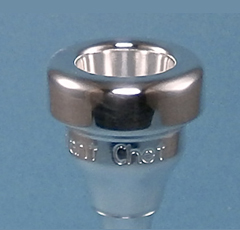 The Ingram "Instant Chet" trumpet mouthpiece offers an extremely mellow sound, not unlike that of Chet Baker. Range can be limited with this mouthpiece. In some instances, using this mouthpiece with a trumpet can be a passable substitute for a flugelhorn. This mouthpiece is shorter than a standard trumpet mouthpiece in length. It is approximately 3.125 inches long. The inner rim diameter is 0.660". The outer rim diameter is 1.070". This mouthpiece comes stock with a #17 drill and the backbore is more open than other mouthpieces in the Ingram line. All of the mouthpieces of the Ingram Signature line are randomly tested by Mr Ingram to ensure that the playing characteristics are exactly as designed. To purchase any of the Ingram Signature Line Mouthpieces, CLICK HERE to go to the purchase page. In addition to online sales at the OneTooTree website, "The Roger Ingram Mouthpiece Line" can also be purchased directly through a few select music retailers: Joy Brass of Sanada & Co (formerly Shires Music) in Ota-Ku, Tokyo, Dillon Music in Woodbridge NJ, Stewart's Music in Niantic, CT, J.W. Pepper in Exton, PA, and Pickett Brass in Lexington KY.